« Alpaca – why is it so good for your family? I walk with my little lantern, My lantern travels with me. Above the stars are shining, And down below shine we. Shine bright my light! All through the night! Rabimmel, rabammel, rabum. Shine bright my light! All through the night! Rabimmel, rabammel, rabum. To encourage sharing, try a special Martinmas breakfast of a croissant or bread that can be cut in half and shared with the person next to you, to remind us of St Martin cutting his cloak in half and giving it away, and to value community and the gifts we all bring to others. Given that wool coats last through many children, Martinmas is a good day to hand on coats that your family have grown out of to a new family to enjoy. No need to cut them in half though! There are more nice ideas at The Wonder Of Childhood's Martinmas post - here. 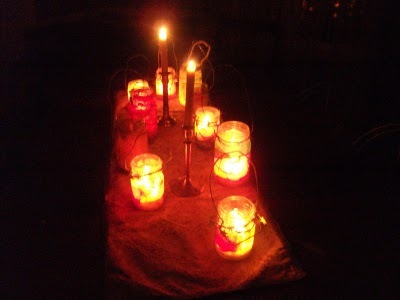 Finally here are are a few tips to keep you warm if you go on a lantern walk. Several light layers trap extra air, giving more warmth and breathability. Wool/silk vests and fine NZ Merino tops and baby-bodies are particularly good for this, and our lightweight jumpers. Long-johns or leggings make SUCH a difference under trousers. Wool socks inside boots for children and grown-ups (even if the boots leak or feet get wet, they'll still be warm and cosy). Lined wool booties for young babies keep the tiniest feet warm. Finally, choose a warm, practical hat that's comfortable for your baby and which your older child actually likes! This entry was posted on Sunday, November 11th, 2012 at 9:53 am	and is filed under for the seasons. You can follow any responses to this entry through the RSS 2.0 feed. You can leave a response, or trackback from your own site.